Giving the Fox and Grapes a send-off. On Sunday morning, a scene unfolded that I’d been expecting for the last ten years. The Fox and Grapes pub on Freeman Street had been empty since 2006 but was now finally being levelled in the lead up to creating the concourse for HS2. The pub occupies a blank spot in most people’s understanding of Birmingham city centre…. if you have parked in Moor St car park (now also closed) you may have been vaguely aware of a hulking, disused pub at the car park’s periphery, in the direction you were not going. You may also have walked past it on your way to active pubs and bars, for example The Woodman on New Canal Street or Kilder in Shaw’s Passage. If you did register it at all, it would have resembled many other broadly similar and forgettable disused pubs in Birmingham side streets: standing alone on the levelled block, windows boarded up, graffiti daubings and an unfixably burnt out roof space. But the Fox and Grapes was an important piece of Birmingham history, as it represented the last building standing from Birmingham’s early days as a pre- industrial revolution market town. It was on the first map of Birmingham, drawn up in 1731 by William Westley - or rather the building that later became the pub. I’ve seen the date 1729 attributed to it, but a Archaeologist’s survey before it closed suggested there was late 17th century fabric in the structure. 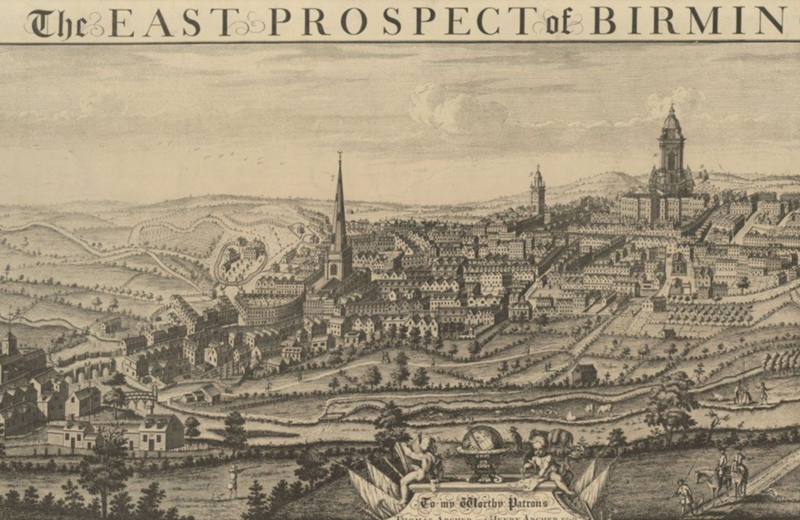 Westley also created a much-reproduced set of etching showing Birmingham from various ‘prospects’ a few years later: a hillside covered with small, steep gabled houses with tiny windows, surrounding a central Baroque church - St Phillips. It looks like an attractive Italian hill village. One of the reproductions appears at The Ivy on Temple Row. I pointed out to a visiting group recently that only St Philips and the Fox and Grapes remains from this image - everything else had since been demolished (mostly by the Victorians) and that it was not usual for English cities to do this to their old town. Why had we done this? they asked. Nearly everything about St Philips physical make up has been replaced over the years and it is Baroque in appearance alone. This was much the same story for the Fox and Grapes. The pub even had some mediaeval design about it: timber structures would soon be overtaken by brick built houses but in 1690 brick was still too expensive for most buildings. Not much had changed in house design since the mediaeval period, and the Fox and Grapes and the jettied floor design, steep sloped roofs, tiny single upper window and narrow footprint were characteristic of a much older style. As the centuries passed, the material of the Fox and Grapes would be replaced and improved, and the building expanded, but the overall appearance would remain the same. It reminds me of the Christopher Wray building a few streets further on: an overlooked 1740 survivor which has been given listed status not for its age but for the Birminghamesque way the fashionable townhouses had gradually filled in their back gardens with industry as the land became more valuable for commerce than leisure. The city’s story and character being told not by the building style but by its various alterations. The Fox and grapes was also a listed building and (until yesterday) told a similar survivor’s story. It originally appeared in HS2s Big Plans as being the subject of a sensitive re-integration of the building into the station’s larger design. It’s difficult to imagine how this might have looked next to Leon, Pret and the usual concourse suspects, but an example exists of the Eagle and Ball being successfully integrated into the student union bar at Curzon Building nearby. However, redrafts of the document downgraded the plans to the sensitive relocation of the building elsewhere, which also seemed unlikely. 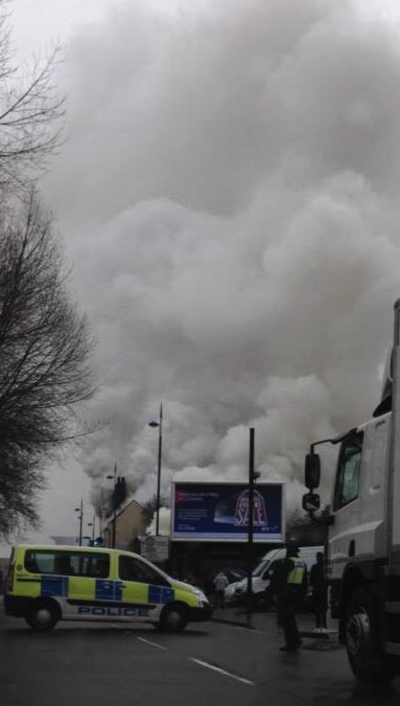 On the afternoon of Saturday 3 January, 2015, a fire ruined all three roof spaces of the empty building, signalling the end of any genuine notion of saving the building. On Sunday morning, I saw a digger twitching next to the pub, and saw that the roads had been sealed off. I thought I’d have time to join Brutiful’s Spaghetti Junction walk and be back in time to see what was happening, but by 1 30pm it was too late: the building was a pile of rubble and timber. The timbers would be interesting to get a closer look at: there should be some conspicuously older beams amongst the later woodwork, like these I found in a field in Rowley Regis. In the decade leading up to the pub’s disappearance, I wondered how I’d feel when it eventually was flattened. I thought it would be strange for a city to remove its last C17 survivor from the old town and - unlike Central Library’s demolition for example - that it would happen without anyone noticing. I realised back then any preservation campaign would be unlikely to succeed. I know only myself who ever had a drink there. As you’ll expect from a city who’s motto is Forward, Birmingham is certainly not sentimental about preserving the past, though there are occasional exceptions such as the Back to Backs or the Roundhouse Stages (both saved by the National Trust). Ultimately, demolishing the building was the ultimate expression of Birmingham’s architectural style. To try and cloak his disappointment and lack of success, he declared that he was sure that the grapes were sour anyway and not worth having.